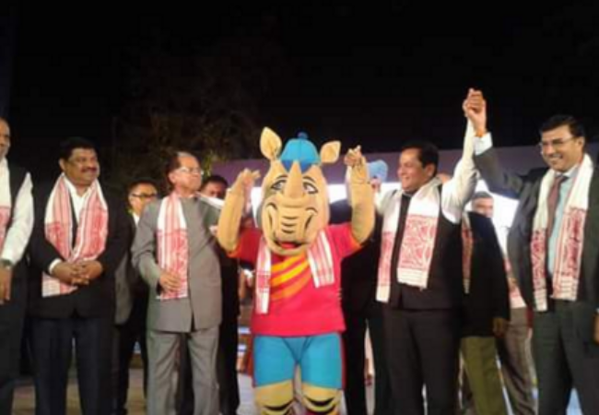 The Organising Committee of the 12th South Asian Games, 2016 (OC-SAG) on Sunday unveiled the logo and mascot of the Games in a ceremony held at the ITA Cultural Center Machkhowa, Guwahati, Assam. Beautiful North Eastern cities of Guwahati and Shillong would jointly host the Games from February 6-16, 2016. Chief Minister of Assam Shri Tarun Gogoi, Union Minister of Youth Affairs and Sports (Independent Charge) Shri Sarbananda Sonowal and Sports Minister of Meghalaya Shri Zenith Sangma were present on the occasion. At the launch ceremony the OC-SAG also kicked-off its Volunteers Programme which is open to the general public. After the unveiling ceremony, the mascot of the Games travelled around the city with the bikers from the Assam Bikers Group. Artists from Srimanta Sankardev Kalakshetra, Guwahati performed at the event. About 4500 sport persons and officials from 8 countries are expected to participate in 23 events from 6th February to 16 February 2016 in 12th South Asian Games. Earlier in July this year, the OC-SAG held an open design contest to invite logo and mascot designs for the 12th edition of the bi-annual international multi-sport event. The Logo and the Mascot of the Games were selected from around 450 entries each. Kolhapur’s Anant Khasbardar and Abhijeet Krishna of NIFT Patna won the mascot and logo designing contests respectively.